A few St. Patrick’s Days ago, I joined a Celtic group who gather a few times a year in the Golden Triangle area for a lovely Irish-themed luncheon consisting of corned beef and cabbage, with carrots and potatoes and Irish Soda Bread. The food, the company and the charm of the occasion was so special. I can’t remember what was for dessert, but I remember it was green! Everyone had a fun time with a historic presentation by the host and quite a lot of lively conversation about Irish heritage. Later that evening, they would meet at the top floor of Mugshots in Starkville for more merry-making and some sort of unofficial St. Patrick’s Day parade. I did not attend the second part of the meeting because I knew it would last until the early hours of the morning! But the food was FANTASTIC! Corned beef and cabbage are what I think of for St. Patrick’s Day food. I asked Facebook, Twitter and Instagram friends and followers if they typically fix special food for St. Patrick’s Day, March 17. Apparently, very few do anything specific. John Stephenson said they typically did not eat anything special for St. Patrick’s Day, but he is planning on preparing potato soup this week. Several said they would be preparing potato soup and thinking Irish! Combine potatoes, celery, onion, water and salt in a large soup pot. Simmer covered for about 20 minutes or until the veggies are tender. Stir in remaining ingredients, return to heat and cook until thoroughly heated. Makes about 7 cups. But, for traditionalists, I thought I would try this just for fun this St. Patrick! Trim brisket of all visible fat. Spray a large slow cooker with nonstick spray. Place onion, potatoes and carrots in bottom of the slow cooker and place corned beef on top. Whisk together bouillon, garlic, Worcestershire sauce, dry mustard, and beef broth. Pour the liquid over brisket. Cover pot. Cook on low setting for eight to ten hours, or on high for four to five hours, adding cabbage wedges and caraway seed for the last hour of cooking. To serve, discard cooking liquid, slice meat and serve with mustard if desired. Jean-Anne Wells’ husband is half-Irish and for St. Patrick’s Day, she makes Beef and Guinness with soda bread. She said it was DELISH! Trim the meat of any fat or gristle, cut into cubes of 5cm and toss them in a bowl with 1 tablespoon oil. Season the flour with salt, freshly ground pepper and a pinch or two of cayenne. Toss the meat in this mixture. Brown the meat on all sides. Add the onions, crushed garlic (if using) and tomato purée to the pan, cover and cook gently for about 5 minutes. Transfer the contents of the pan to a casserole, and pour some of the Guinness into the frying pan. Bring to the boil and stir to dissolve the caramelized meat juices in the pan. Pour on to the meat with the remaining Guinness; add the carrots and the thyme. Stir, taste, and add a little more salt if necessary. Cover with the lid of the casserole and simmer very gently until the meat is tender – 2 to 3 hours. 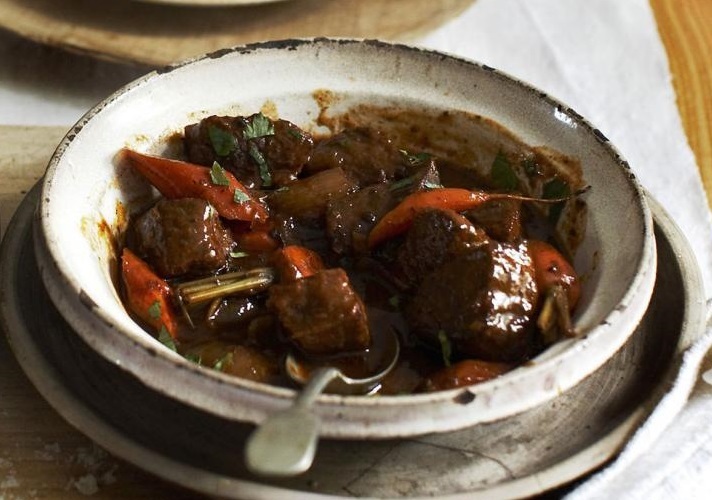 The stew may be cooked on top of the stove or in a low oven at 150C/gas mark 2. Taste and correct the seasoning. Scatter with lots of chopped parsley and serve with boiled potatoes. Preheat the oven to 250 degrees C. Sieve the dry ingredients. Make a well in the center. Pour in all the milk at once. Using one hand, with your fingers stiff and outstretched like a claw, stir in a full circular movement from the center to the outside of the bowl in ever-increasing circles. The dough should be soft-ish, not too wet and sticky. When it all comes together, turn it out onto a well-floured work surface. Wash and dry your hands. Tidy it up and flip over gently. Pat the dough into a round, about 4 cm deep. Cut a deep cross on the loaf and prick in the four corners. Bake in the oven for 15 minutes then turn down to 200 degrees C for 30 minutes until cooked. If you are in doubt, tap the bottom of the bread, when it is cooked it will sound hollow. Cool on a wire rack. Tip! 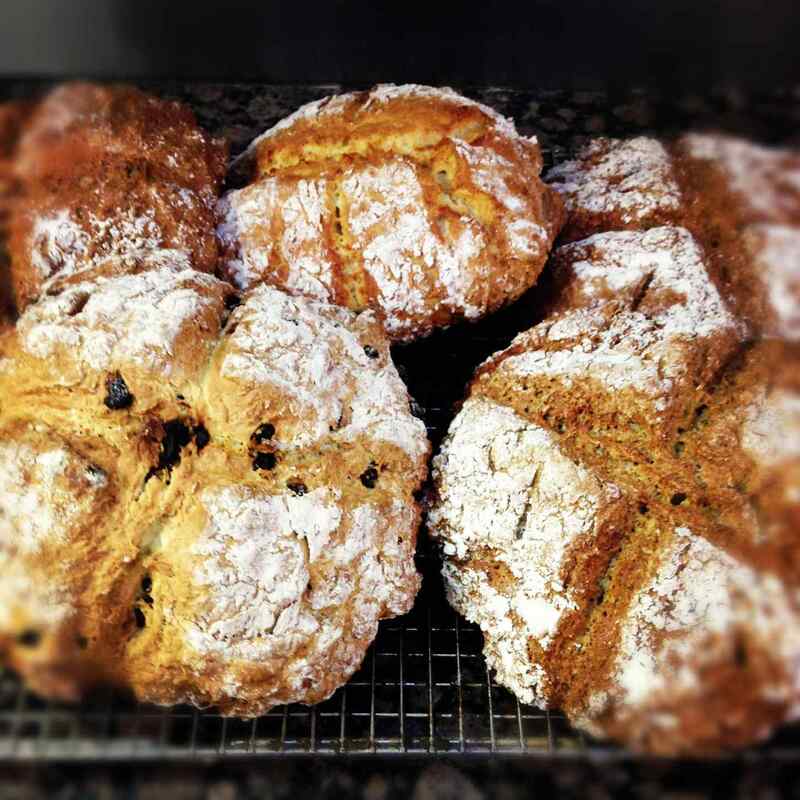 Soda breads are best eaten on the day they are made but are still good for a day or so more. Can you tell Jean-Anne Wells lives in England? Using the metric system in the kitchen! !